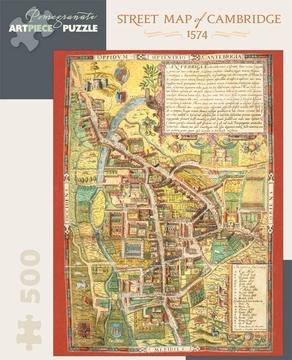 Cantebrigia urbs Celeberrima a Granta fluvio vicino..., 1574, by Richard Lyne. From De antiquitate Cantebrigiensis Academiæ. Cambridge, England, was a thriving university town in 1574 when this street map was published. The map points out colleges, chapels, lodgings, and features of particular interest to students and visitors. It appears within the two-volume set of books titled De antiquitate Cantebrigiensis Academiæ, a peculiar tome endeavoring to answer the question of which was older, the University of Cambridge or the University of Oxford. De antiquitate Cantebrigiensis Academiæ is in the collection of the British Library, which encourages research and promotes education while engaging the public through the display and interpretation of its extraordinary resources.